One of the first things we do when starting a new project, be it a writing a report for GBDA 102 or developing the next Angry Birds app, and whether we're working on our own or in a team, is to start laying out all of the pieces of the project puzzle. We know the final objective we want to work toward, but now we have to figure out all of the steps to get us there. This is where brainstorming comes into play. MDEI students brainstorming on the white wall in a project room. Brainstorming allows us to look at the big picture and start to break it down into manageable problems, and come up with appropriate solutions for those problems. This process, at the start, tends to be fairly relaxed and informal (yes, you could do it in your PJ's, but I would only recommend doing so at home, not at work or school). It generally consists of throwing out as many thoughts and ideas as one can come up with (no matter how impractical), in an effort to generate as many creative solutions as possible. 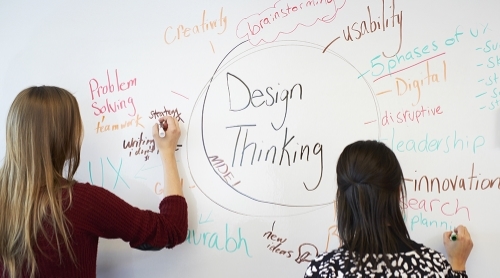 Prior to immersing yourself in the ideation process, you may choose to do some research. Surf the 'net and use your Google-fu to get some inspiration, or look up the definition of your problem(s) on Wikipedia. If you're old school - you know, born before 1990 - you might choose to look at books or magazines (print, not digital), to help start the idea mill. The brainstorming process can be done in a number of ways - there are no hard and fast rules. You can sit with a pencil and paper, use a white board, or use a computer. Heck, you can even use an Etch-a-Sketch if you want and have the skills! It's up to you and what you are most comfortable with. Next you can decide how you want to record your ideas. It could be as simple as a bullet-point list, a word cloud or a mind map, ideas written on sticky notes (this can be helpful as you can move the notes around as you work through the problem and solution), word association, or free-writing. There are many methods to choose from, and you should use the technique that will work best for you (or your team) to get the ideas flowing. However, be careful not to get stuck in a rut. Don't use the same technique over and over - step out of your comfort zone and try other techniques. You'll be surprised with how many new ideas you can come up with by switching things (i.e., your thought process) up. When working with a team, it is crucial to remember that there no bad ideas. (In fact, even when working individually it is crucial to remember that there are no bad ideas!) Make sure that everyone in the team is given a chance to contribute to the conversation and voice their thoughts. By hearing from all members of the team, you will get the widest range of solutions possible, giving you more to work with. Just imagine, if out of a team of six, only three people were given the chance to share their ideas. If each of those three come up with five ideas, that is a total of 15 ideas. But if all six members of the team each share five ideas, you get twice as many ideas to work with! How can that be a bad thing? In my humble opinion, the saying that "less is more", does not apply to ideation. Once the initial brainstorming process is complete, you can then begin narrowing down the ideas to something that will give you the best result for your problem. This could be a single idea, or a combination of ideas. Be careful not to arbitrarily throw away any ideas as you go along because they might seem impractical on the surface, as it may be that they actually do work when put together with another idea. Work through your all of the ideas you've come up with step-by-step until you think you have the best solution. And here's a tip: make sure that you save your brainstorming content so that you can refer back to it as you complete your project. If at some point you get stuck, it is entirely possible that the solution to your current problem has already been thought of and recorded for you. This saves you the hassle of having to start the process over. That being said, if you are truly stuck and none of the ideas you're chosen to work with are panning out, don't be afraid to chuck the lot of it and start fresh with a new brainstorming session. Design is a process, and sometimes that process involves starting over. Stephenie Koerne is a Digital Media Lab Instructor at the University of Waterloo Stratford Campus, but is better know as Jill-of-all-Trades. When not juggling work tasks, Stephenie wiles away the hours working on her photography and other art projects, collecting toys, and reading. She loves pop culture, music, cats, and pink is her signature color. CMYK, RGB, Additive, Subtractive, Primary, Secondary, Tertiary…what does it all mean??? Well at the base level these terms all refer to categories of color. But isn't all color the same? Blue is blue and red is red, right? When using a smart phone, a point-and-shoot camera, or even sometimes with a DSLR, people don't really tend to put much thought into what aspect ratio they are using. They think about exposure, lighting, focal length, and even special effects, but not so much about aspect ratio - it just isn't something that first comes to mind when setting up a shot. ©2018 Stephenie Koerne. All rights reserved.